The Villeroy and Boch Design, Premium and Comfort range of hot tubs give you the freedom of combining your preferred jets with your favourite seat. You can choose between 16 different JetPaks and position them at every seat in no time at all for a wellness experience that is exactly tailored to your respective needs. 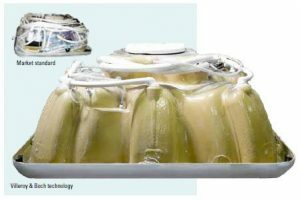 Thanks to this patented JetPak technology, hot tubs can be upgraded at any time to include the JetPaks with the latest jet technologies. Relax Flow Therapy – Experience the comforting warmth of your hot tub and the gentle tingling of an invigorating massage, mental stress simply washes away. Quality drives every decision in engineering a Villeroy & Boch outdoor spa. It shows in what you see and what you don’t. Components like the EnduraFrame™ are built with laser precision and assembled with care. 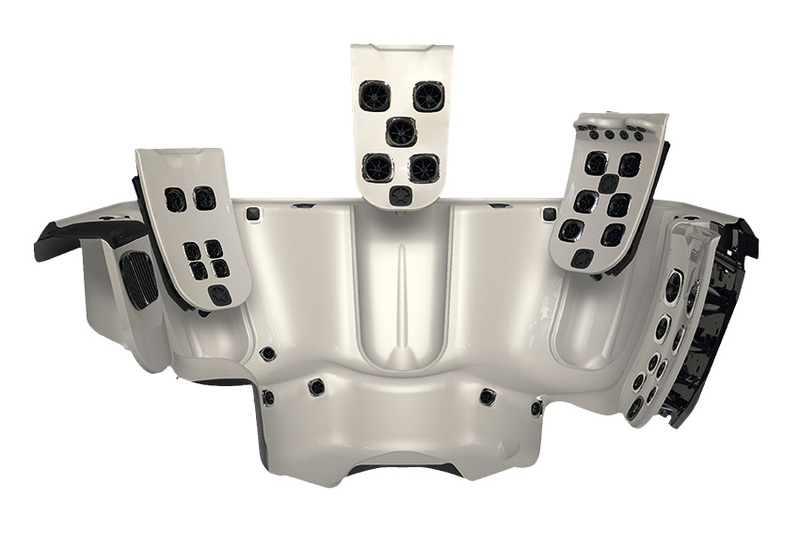 Extra supports are even added in high-usage areas to strengthen overall hot tub integrity and to create an exact fit. As a part of the design, the composite moulded EnduraBase™ hot tub base has handholds for moving the hot tub, convenient electrical cable ducts for an easier electrical set-up, vents to keep out unwanted pests and an easy-access external drain. From the ground up, your Villeroy & Boch hot tub is built with the utmost precision, using the best materials available. 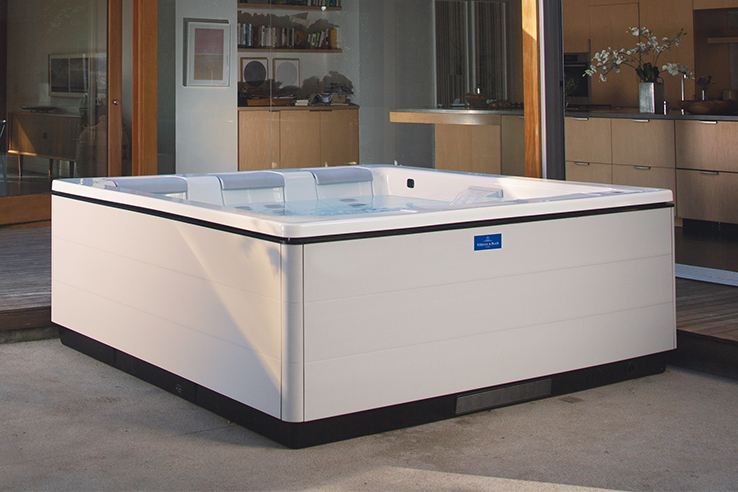 Each Villeroy & Boch hot tub is built on the patented EnduraFrame™ support structure, a sturdy moulded ABS spa frame made without wood or metal so it will never rot or corrode. Their state-of-the-art spa tub construction methods provide enduring support for your hot tub and the thousands of pounds of water it will hold. The moulded ABS EnduraBase™, EnduraBeam™ structural columns and other EnduraFrame™ components are precision aligned the exact same way every time with no human error. Forget your worries and focus on comfort and relaxation. Your Villeroy & Boch outdoor whirlpool is well built and worry free. 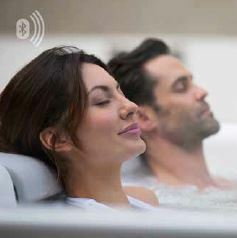 Although the market is still holding on to outdated solutions, we are creating a new transparency: In Villeroy&Boch products, new, intelligent connections replace the seemingly endless pipes in standard hot tubs. 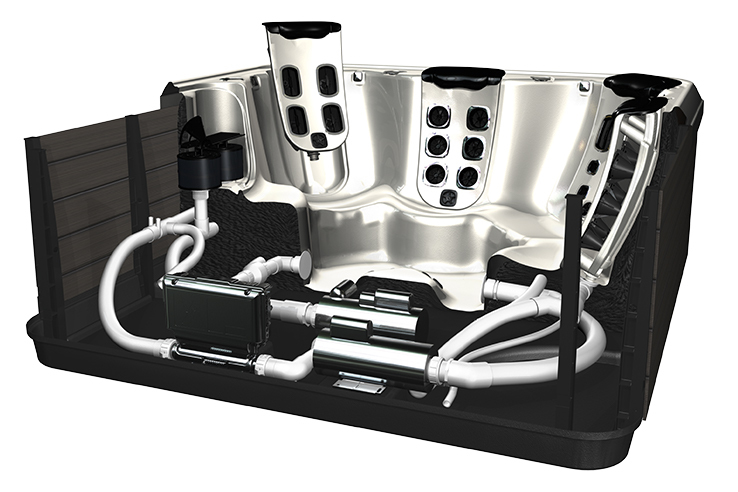 Thanks to JetPak technology, these hot tubs have up to 90% fewer pipes. Villeroy&Boch hot tubs are probably the most economical in the world. The full-foam insulation ensures that no energy is lost: The innovative JetPak technology uses the heat from the hot tub as up to 90% of the pipes run through the warm pool water so the warmth of the water in the pipes is transferred to the water in the hot tub. 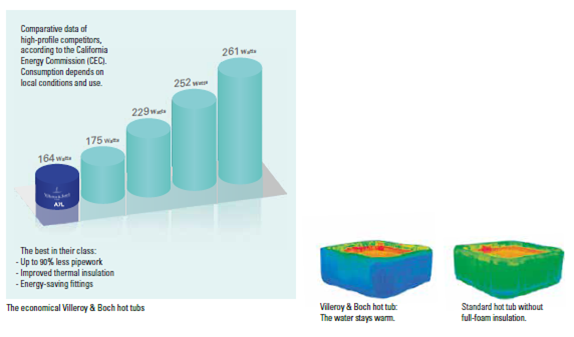 Villeroy&Boch hot tubs are even more efficient because, unlike standard hot tubs that use cold xternal air, they use the warm air from behind the JetPaks and the warm pump area. management system and automatic deactivation of the Ozonator during use, these hot tubs offer maximum safety, comfort and hygiene. Incredibly quiet. Operates quietly and almost without vibration The special performance of the circulation pumps enables an extremely high filtration performance of up to 250 times per day. 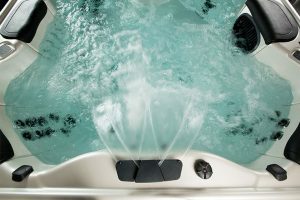 This ensures optimum rinsing of all areas of the hot tub, including the area behind each JetPak – whilst the pumps continue to work extremely quietly in the background. Low-maintenance. Ozone reduces the number of chemicals The Ozonator fitted as standard ensures impeccable water quality and exemplary hygiene. It is absolutely maintenance free and reduces the number of chemicals, such as chlorine. Your Villeroy & Boch hot tub can be equipped with one of three different stereo systems: Elite, Life and Design. – The Elite stereo system can be operated by remote control. The special feature: the remote control floats on water! – The Life stereo system is operated from the outer side of the hot tub. 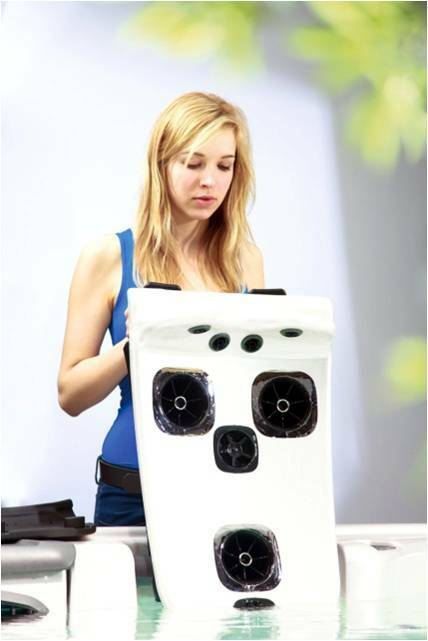 – The Design stereo system for Just Silence. With no visible elements in the outer panelling, it is operated via the hot tub’s touch panel. 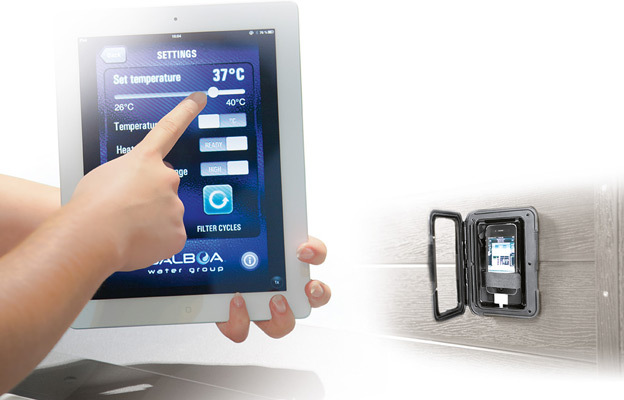 New Villeroy & Boch lines have a high-quality, straightforward control unit. In the Premium Line, it even has a colour display and menu control.